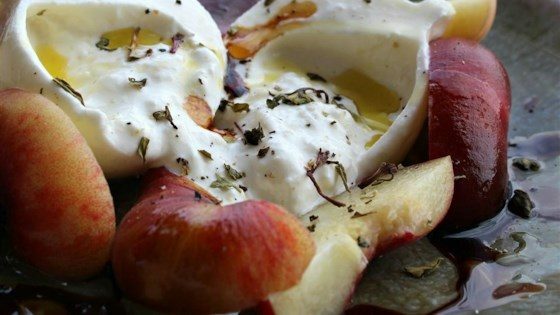 Gently tear open the Burrata to expose the soft, creamy core, and place it in the middle of a plate. Arrange peach slices in and around the cheese. Sprinkle with basil and olive oil. In a small saucepan, bring raspberry balsamic vinegar to a boil, reduce heat, and simmer until vinegar reduces into a thick syrup. Spoon lightly over peaches and cheese. Finish with a sprinkle of flaked salt and optional black pepper. Serve at room temperature with a sliced, toasted baguette. Get ready for compliments and indecent proposals.